There was a point in the not so distant past where the suggestion of a high end luxury pickup truck would have seemed nothing shy of absurd but times, they are a changin’ and the 2014 Chevrolet Silverado 1500 High Country Edition is GM’s first shot in the high end truck segment. Across the half ton new truck segment, there is a trend among half ton truck buyers to lean towards a more luxurious design inside and out, with premium models like the Ford F150 King Ranch, the Ram 1500 Laramie Longhorn and the Toyota Tundra 1794 Edition become very popular. The Silverado has previously come with its fair share of amenities, but GM hasn’t offered a real competitor to those other models above – until now. The 2014 Silverado 1500 High Country has a chromed out exterior and a beautifully appointed cabin while still maintaining the ability to do hard working “truck stuff” so having a luxury truck doesn’t mean compromising any capabilities compared to the other new Silverado 1500s. My 2014 Chevrolet Silverado 1500 High Country test truck was pretty much loaded to the hilt with optional add-ons including the 6.2L V8 engine, the Rear Seat Entertainment package, the Power Sunroof, the High Country Premium Package, the premium Chevrolet MyLink infotainment system and LED Lighting in the cargo box. When you factor in all of those options to the standard $48.880 price of the High Country Silverado 1500 and destination, the price as tested sits at $56,965. That is a whole lotta money for a half ton pickup, but when you are considering that you are packing the Silverado 1500 with a bunch of Cadillac level amenities – it is hard to argue with the price. This truck has pretty much everything that you could ask for and it can still tow and haul as well as almost any truck on the market. The 2014 Chevrolet Silverado 1500 High Country is designed to compete with the glitziest luxury trucks on the market and that begins on the outside with a proper premium look with lots of chrome. Up front, the stacked headlight design has chrome inner bezels and chrome trim that flows into the gigantic chrome grille. From the thick surround to the bars running through the middle to the trim around the gold Chevy bowtie logo, the High Country is chromed out; including the lower portion of the front fascia and the fog light housings. This chrome cladding goes a long way in adding a big dose of luxury to the big, bold front end of the new Silverado. Along the sides, the High Country Silverado has chrome mirror caps, chrome door handles, chrome body trim running along the lower portion of the doors, the unique chrome High Country badges, 6 inch chrome step bars (a $700 option) and a set of uniquely designed 20 inch bright chrome aluminum wheels that I really think fit the lines of the Silverado perfectly. 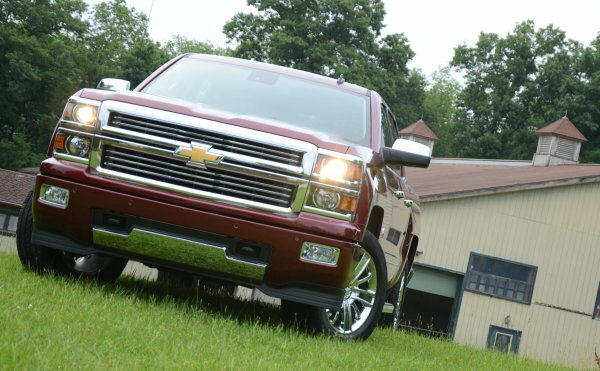 In my opinion, there is no wheel choice that looks better on the new Silverado 1500. Chrome aside, the bold, hard lines of the new Silverado give this half ton truck a confident, upright look while the squared off wheel openings add a sporty feel across the entire 2014 Silverado lineup. The back end is surprisingly void of chrome outside of the Silverado badging, the Chevy bowtie and the High Country logo with the bumper trimmed in black and body color. The stacked taillights are simple but they fit the squared off design very well along the back of the truck – and when viewed from the side. Even without a flashy chrome trimmed bumper, the High Country rear end still fits the part nicely. When combined with the Deep Ruby Metallic exterior paint, there is no question that GM achieved their goal of giving the Silverado 1500 High Country a very high end look while the basic, bold and squared off design of the entire Silverado lineup brings a muscular look that accepts the luxury role very well. Lots of modern trucks have chrome trim on the outside without the same level of luxury on the inside – but as soon as you open the driver’s door of the 2014 Silverado 1500 High Country, there is no doubt that this is a premium luxury trim line. The plush front bucket seats of the Silverado 1500 High Country are finished in a medium brown with white piping, white stitching and have the High Country logo embroidered into the headrests. The front seats are both heated and cooled, with power controls that allow a comfortable driving position for even the shortest drivers…but there is still a ton of space in every direction for even the tallest driver. Whether you are 4’10” or 6’10” – you will be able to drive the Silverado 1500 High Country in comfort, even on the hottest summer days or coldest winter nights. The rear bench seat has the same brown leather, plush padding, white piping and white stitch work, but those folks in the back don’t get heated seats…which kind of surprised me considering the growing trend of heated rear seats. The good news for those folks sitting in the back seats is that there is a ton of space. You would expect a full size truck to have plenty of rear legroom, but that is not always the case. Fortunately, the Silverado Crew Cab design offers enough rear seating space to comfortably seat very, very tall adults. Also, the optional rear entertainment system allows those folks seated in the back a chance to watch their favorite movies while on the go – a great option for parents who do lots of traveling with the kids in the back. The medium brown leather from the High Country seats is continued into the front and rear door panels, across the top of the center console and across the entire face of the dash board. The grab handles are finished in high gloss wood and there is a light scattering of chrome through the cabin. Finished off with dark carpeting and a light headliner, the High Country has the proper look of a high end luxury truck. Those truck owners who like or need lots of storage space are sure to love the cabin design of the 2014 Chevy Silverado 1500 High Country Crew Cab. The center console between the front seats has a large storage area at the front with dual charging ports and several auxiliary inputs, a “trench” area running along each side of the console, two cup holders and the massive under armrest storage compartment. I also like the lid of the center console/armrest, which has a ridge running down the middle of it which serves as a handy spot to park your cell phone while driving. The Silverado also has an over/under glove box design and large pockets in the doors so pretty much anything you need to stow while driving will have a space. The centerpiece of the 2014 Chevrolet Silverado 1500 High Country is the infotainment system that is controlled by a big, bright touch screen. The touch screen allows the driver or front passenger easy access to the sound system, the navigation program, the hands free phone system and a variety of Apps like Pandora radio, the weather channel or much, much more. If you don’t always love using the touch screen, there is a minimal collection of knobs and buttons just under the screen to quickly access things like the radio volume or station, etc. Also, the heated, leather wrapped steering wheel has buttons to control the adaptive cruise control and the driver’s information screen in the gauge cluster. The gauges themselves are very traditional, with analog readouts for the tachometer, speedometer, engine temperature, fuel level, battery levels and oil pressure – but the buttons on the steering wheel allow the driver to customize the center screen with information on the radio, the navigation and vehicle information including a digital speedometer. Finally, the driver can push a button on the steering wheel and control pretty much anything inside of the Silverado High Country with his or her voice. The 2014 Chevrolet Silverado 1500 High Country Crew Cab checks every box when it comes to the modern luxury “must have features” from the plush leather seats to the high end infotainment package – with gobs of passenger space that will make for a comfy ride for you and three of your tallest friends. This truck is plush and comfortable in every way while the design of the interior looks like something that you’d be more likely to expect from the Cadillac brand. The 2014 Chevrolet Silverado 1500 High Country is powered by the 6.2L EcoTec3 V8 that makes it the most powerful truck in the current half ton segment, with 420 horsepower and 460lb-ft of torque. I am a fan of trucks that can sure my need for speed and as non-performance model trucks go, the High Country is mighty impressive. From a stop, mashing the throttle without the aid of four wheel drive will result in a hefty amount of wheel spin, but once you get the back tires to bite – this Chevy pickup offers some serious low end grunt. The 6-speed transmission shifts quickly from gear to gear under hard throttle and that allows you to get from a stop up to cruising speeds in a hurry. The monster acceleration from a stop is nearly equaled at cruising speed, as the 6.2L V8 pulls nice and hard in the midrange as well…allowing you to blast around slow moving vehicles on the highway with no problem. As part of my routine truck testing, I hooked the 2014 Chevrolet Silverado 1500 High Country up to my 5,000lb horse trailer and, not surprisingly, it performed beautifully. The 420hp and 460lb-ft of torque that allow the High Country such intense acceleration translate to an easy, comfortable towing experience even when tackling steep, hilly highways. Like all new trucks with a towing package, the High Country has easy access ports for both 4- and 7-pin trailer connectors and on the inside, the standard integrated trailer brake controller allowed for quick and easy adjustment while towing my two horse trailer. This setup helps you stop the combo easily but even with the integrated trailer brakes turned all of the way down (for those folks whose trailers don’t have brakes), the High Country has no issue bringing the trailer down to a stop when only using the truck’s brakes. Acceleration and braking aside, the Silverado High Country handled nicely while hooked up to the trailer, with very little of the trailer noise echoing into the cabin. The same suspension setup that affords the High Country a smooth, quiet ride on even the roughest Detroit highways is still strong enough to take on a rough unpaved road while also taking the weight of my horse trailer in stride. Some trucks can have their ride quality affected when you hook up a trailer, but I found the new Silverado 1500 High Country to be every bit as smooth while trailering as when it is free of any added weight. You are aware that the weight is back there, as there is an appropriate amount of feedback through the hitch, but it is far quieter and far smoother than some other half ton trucks when hooked to my trailer. Along those same lines, the High Country handled well and offered a stiff yet smooth ride when the bed is filled with 800 pounds of bagged grain. The rear end may have sat a little lower when the bed was filled, but the ride quality and road handling qualities were barely affected…if at all. I understand that not everyone will be pulling a trailer or hauling hundreds of grain with their new 2014 Chevrolet Silverado 1500 High Country, so for those who want a big, powerful truck “just because”, it will not disappoint. All of that power makes it one of the quicker high occupancy, full sized trucks sold in America and even with the high riding stance, it handles well on the highway and around town. Most importantly, the luxurious cabin is one of the quieter options on the market – adding to the luxury feel. In terms of fuel economy, the expectations for the 2014 Chevrolet Silverado 1500 High Country aren’t all that high, but that is what should be expected from a fully loaded luxury truck with the most powerful engine in the class. The EPA promises 14mpg around town, 20 on the highway and a combined figure of 17 miles per gallon. I did not hit that combined number during my 8 days with the High Country, but I did put over a hundred miles on it with the trailer and probably another 30 miles with the bed packed full of grain. Even with all of that work coupled with some high performance driving (I enjoyed the acceleration capabilities of the 6.2L V8), I managed to average 15.3 miles per gallon. More importantly, during one long highway run with no additional weight, I was able to average 21.6 miles per gallon so those who do lots of highway driving in a flat area like Metro Detroit should be able to best the EPA highway fuel economy expectations. Even though the 2014 Silverado 1500 High Country is a premium luxury model, it offers just as towing and hauling capacities as the rest of the lineup while the 6.2L V8 offers the most cure for your need for speed. Some critics of high end luxury trucks might accuse these pretty faced half ton pickups of being soft, but that is not the case whatsoever with the 2014 Chevrolet Silverado 1500 High Country. The High Country exterior packs as much chrome as you can ask for and the interior offers almost all of the luxury amenities that you can get in the Cadillac Escalade, but none of any of those cushy goodies or exterior bling have any negative impact on this truck’s ability to haul heavy loads or pull a fair sized trailer without breaking a sweat. If you want the most powerful half ton truck on sale today with a chromed out exterior and a premium interior layout – the Silverado 1500 High Country is the truck for you. This gleaming half ton Chevy might look like a city slicker’s truck…but it will have no issues working side by side with any other half ton truck in America. Also, when not weighed down, the High Country with the 6.2L V8 will beat pretty much any truck in America in a stoplight dash while the driver and passengers bask in the lap of luxury.